I have a passion for draping. Draping for me is like drawing because I can express what I want to design. When you drape you can visualize better the fit and you can also feel the fabric and how it moves. I used to drape a lot at my school's library. The school library has lots of beautiful fabrics that the students could use only for draping and without cutting anything. Each piece of fabric measures approximately three or four yards; your challenge was to figure out how to drape a dress using only pins and that amount of fabric. Here I'm showing you some of the dresses I draped. 3. 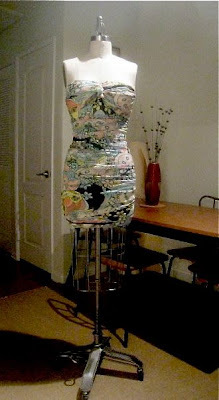 The last one is a cocktail dress that I draped and then sewed. It's totally wearable and I made it for myself. The straps are braided as well as the top edges of the bust area. I made the braids by hand. The bust is hand pleated too and it's totally comfortable and looks very flattering on the body. Fabric: Silk shantung. Gorgeous!! All three are fantastic, but I looove the color of the last one. These dresses are beautiful! You are so very talented and creative. I really like the middle one, a little too short for me, but beautiful nonetheless. The last one is exquisite with the pleated and braided detailing. I think all three look cute! You're really good at it! I'm absolutely in love with the first dress. Do you sell your designs? Thank you so much Anonymous, I'm working on that, but if you like what you see, you can always send me an email and we can discuss about it. Thank you so much for the sweet comment. I'm glad you like my work!! 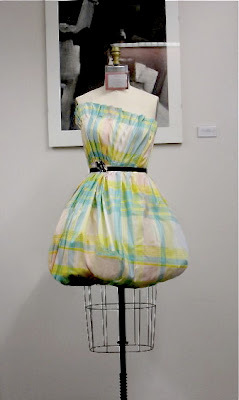 I am enamored with your pleating skill ... such lovely workmanship!